We sped through a couple of planets: Candia was a desert planet ruled by yet another dictator. Le Suroit stopped by the gas giant, made a few wilderness runs with Travis learning to fly the pinnace, the regular maintenance by the engineers, a very successful research roll, then on to the next system. T'yana is a rich garden world. Travis and Li restocked with fresh produce as well as frozen and packaged supplies while the pinnace made a few trips reloading fuel and cargo. There was yet another very successful research roll, so Dr. Boris is making headway on the Lord Fish issue. This is where they left off: our next session we'll see how well Travis does on his astrogation, how well the doctor and scientist manage to continue their research on Girly Girl (the name of the Lord Fish, who is in a huge tank in the main lab). Selshor is where the Katydid crashed more than 6 months ago, getting on to a year now. 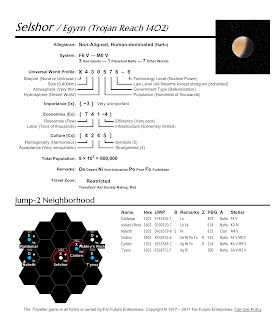 Selshor is outside the Imperium, so while the physical status are well known, the politics and society are not as well known. Dr. Francine Occa, who was a crew member of the Katydid and managed to escape, only knows that the population is even more xenophobic than Cyan's ruling class, and that the ship crashed on a high plateau with extremely thin air. Her rescue was quite fortunate - Selshor does not get many passing ships. She recommends extreme caution in their approach.